Brochures are a pdf and will require adobe acrobat reader, click here. Certificates and wallet cards will be mailed to those who earn certification. All certified technicians will also be listed on the ABRA website. 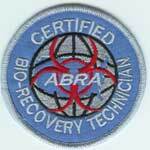 Currently we are the only company in the world to have 100% of our technicians certified by the American Bio-Recovery Association.